by Eric Chiu, Eric Chiu "
Just ratified in March 2001, ebXML is the new standard for B2B data exchange and the cornerstone of the next generation of B2B applications. IT managers are now scrambling to plan for the huge and complex job of upgrading their non-XML legacy systems. 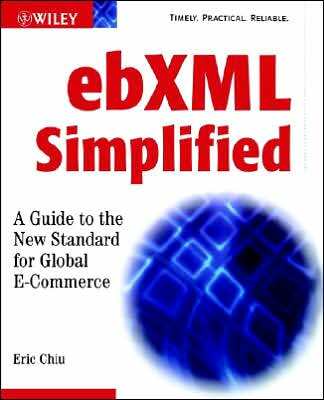 This book provides a concise, yet thorough introduction to ebXML and features guidelines for making strategic decisions concerning ebXML implementation. Following an overview of ebXML, the problems it solves, and how it relates to other standards, the author explains how major B2B vendors plan to integrate ebXML into their products. Eric Chiu then takes a detailed look at ebXML's technical architecture, with discussions of its design conventions and each of the major specifications that comprise ebXML.